Late in 2018, the Trust were awarded some funding from the Aviva Community scheme. 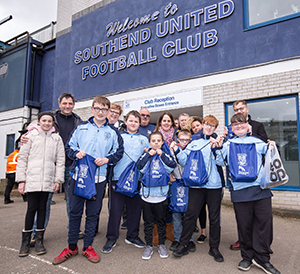 The money allocated was to encourage more disabled/disadvantaged kids to attend football matches at Roots Hall, and also to reward individuals who had made a difference in their community. The Trust have carefully selected a variety of people/groups to approach with offers to visit Roots Hall and, in close association with the club, were delighted to welcome a group of 6 amazing boys from Kingsdown school on 16th Match for a 'Day to Remember'. Kingsdown is a special needs school for children aged 3 to 14 who have severe learning difficulties (SLD), profound and multiple learning difficulties (PMLD), physical disabilities and associated learning difficulties. During their ‘Day to Remember' the very ‘enthusiastic' boys – Leo, Toby, Oli, Harry, Reggie and Alfie - were taken to the dressing-room to meet all the players to get all their autographs. The boys were then joined on the pitch by the entire first team squad for a group photo. After the photo, the Kingsdown group were taken to an Executive box to enjoy the match in style – with plenty of food and snacks!! Each boy was also presented with a goodie bag. The Trust has received messages from the school, and the parents, that the boys thoroughly enjoyed their day at Roots Hall.